On January 24, 1984, the world said hello to a computer for the ages - a revolution known as Macintosh. During Super Bowl XVIII, two days prior, the world would find out why 1984 wouldn't be like 1984. On that day the Macintosh 128K was first introduced to millions. The Apple Macintosh and the legendary status that would follow was forever ingrained in the computer industry - and in the hearts and minds of a people who believed this machine would change the world. Macintosh changed the way people worked with and thought about computers. It also had its critics. Geeks chastised the little putty box with its 9" screen, calling it a toy. A "real man" wouldn't be caught dead using newfangled technology that employed the use of windows, menus, and - gasp - a mouse! For the geeks, the idea that a computer existed that didn't have a command line was blasphemy and utterly atrocious. Heaven forbid a computer be released that didn't use arcane commands and was actually easy to use by the masses! Clearly, Macintosh wasn't aimed at tech savvy people, and in the end, history proved the geeks were wrong in their original assessment that a GUI-based computer would never catch on. Just who was Macintosh aimed at? Macintosh was originally meant to be "the computer for the rest of us." Macintosh held true to the late 90s Apple slogan, Think Different. Macintosh was an attempt to turn the computer into an appliance that you turned on and used without much effort. In large part, the Macintosh succeeded in this endeavor. The Macintosh 128K wasn't without its problems. One of the more common problems was too little memory for the for the operating system, an application, and your documents. Another problem, which would be the Macintosh 128K's Achilles heel, was a lack of software in comparison to the IBM PC - and even Apple's vastly successful Apple II line. Macintosh also had its share of hardware problems. Specifically power supply issues, due to the lack of a fan, and undervalued components such as capacitors that didn't have the sufficient juice to stand up to years of use. Despite these flaws, the Macintosh 128K set the standard that all other computers, regardless of platform, would embody. Although its wasn't the computer that pioneered the GUI, it was the first to bring it to the mass market. The legacy of Macintosh was built higher and more powerful as years went by. The original design with its 9" black & white screen lasted all the way until 1993, when the last Macintosh Classic II rolled off the assembly line. 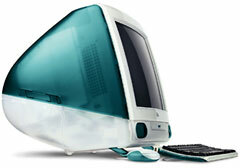 The iMac would eventually bring back the all-in-one concept, albeit in a more colorful fashion. There's can be no doubt: Macintosh has left an indelible mark and a lasting legacy that will forever be stamped upon our memories. 25 years later, although Macintosh has evolved and is now called the Mac, a little piece of the original lingers on. 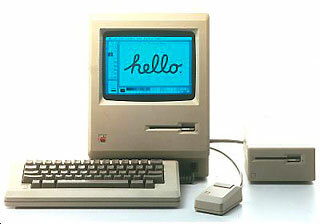 I close by saying happy 25th birthday to a true American original, the Apple Macintosh! Be sure to send me your thoughts and share your Mac memories at thomas (at) lowendmac (dot) com.